Hey Guys, What are some of the ways you guys concealed your hair transplant? My first procedure I wore a hat for a few months. But the second procedure I used hair fibers. I would love to hear your guys input. 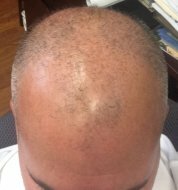 Concealing Your Hair Transplant Immediately After Surgery? Read This First! Best advice to get away with a HT without anyone knowing? Hello, I had to cancel my ht a few weeks ago because I couldn't get enough time out of the office to get away with no one knowing I was having a ht. I'm really bummed. I've asked a bunch of different people and asked for different ideas on how to minimize the redness and to promote growth and healing in order to cover up the ht in the recipient area after a few weeks. I"m just wondering, from Drs. and patients, if you can't wear a hat, and you need a large 4000-6000+ procedure, how the hell can you minimize the redness and increase the recovery so you can go back to work after 2-3 weeks without anyone knowing? I saw on another forum some people said to take human growth hormone, others said they took anti inflammatory meds, others said they wore makeup and used concealers. I've heard about aloe vera and witch hazel and other stuff but no one says they definitely help. Some Drs. I've consulted with say the redness only lasts a week or two, others say it can last up to 6-8 weeks or more. Which I understand a lot depends on me, my skin tone, my healing, etc. But how do you take the chance that it won't be red, and then after two weeks I have to go back in the office with a really pink scalp? If I have to I understand but what do Drs recommend or patients that have hardly any recipient native hair to camouflage the procedure, what do you do? I'm so frustrated right now, where I see so many people getttng ht's and I can't figure out how they can get away with it if they have to go back to work? I'm envious. I can't wear a hat or stay out of my office for over a month? So please for the love of all that is good in this world of hairlessness can some Drs. or experienced patients tell me, what to do if my head is still pink how do I get it to look somewhat normal so I can have an ht and go back to work and not get noticed?? Thank you for the help! Possible to hide the donor scar 2 weeks after surgery?